Being able to migrate your database is an essential part of the health of any application in production. Without the ability to refactor, or rethink your data model things will either become slow, or technical debt will increase. Migrations are essential… but they can also cause the app to break. Say you want to add a column to a 20 million row table. In databases like MySQL that will most likely cause the entire table to lock up for the duration of the ALTERcommand. Locking tables could mean your clients are losing money; you’re depleting your bank account, either way, someone will be angry… Nevermind the political consequences of having your app go down randomly throughout the week. Downtime mitigation is why zero-downtime migrations are so essential to your business and development team. This post will outline the different methods for zero-downtime migrations that I’ve found to be useful. In general, all of these can be achieved through some SQL or relying on a tool like pt-online-schema-change. The basic idea remains the same between all four which is to limit the amount of ALTER commands on a table. Create a copy of the table schema based on the original. 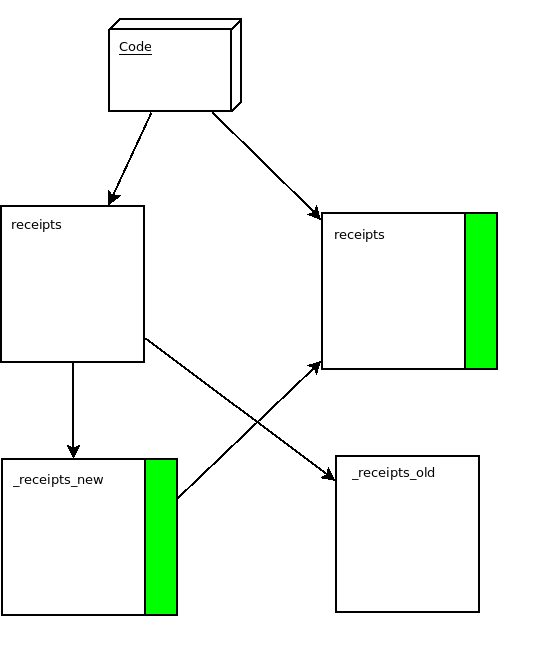 CREATE TABLE _receipts_new LIKE receipts. Chunk through all data in the original table and insert into the new table. The idea here is that we want to migrate something, which we’ll get into in a bit. But we want to either add the column, rename the column, or change the column type here. For instance, if we want to remove `url` from receipts (let’s say we’re going to make these dynamically). Triggers are the bread and butter of zero-downtime migrations. While we can easily migrate all the data from the old table into the new table now, we might miss out on new information. These migrations serve as a way to keep things up to date as the original table is updated. The three triggers are below to capture whenever the original table is updated, inserted, or deleted. Unfortunately, many straight SQL languages don’t allow you to chunk very well. MySQL for example, allows you to do things like LIMIT / OFFSET, but it can be slow as you get further on the table. Determine an optimal chunk size (say 1000) and then iterate through the primary keys incrementing by 1000 each time. Here’s a Rails style version of this. This script will chunk through all of the available records and updates the information. After this is done then the table should be up to date. You can run a quick gut check to make sure everything is there by doing something like this. Though depending on the size, of the table this might be quite large. This should return a count of 0. If it doesn’t that means you have missed some data. Now it’s time to finish. But this shouldn't happen unless the code has a bug. Now I’m going to get into specifics of each type of migration. Each of these four types of migrations has their specific nuances related mostly with code. For instance, if you have code that references a column that doesn’t exist that will cause production issues. But let’s start with the easiest first which is adding a column. Unless your code is a mutant, it won’t reference a column that shows up randomly. Adding a column in this way is quite simple. You can add the column before any code changes go out and as soon as it’s live. Though there is a possible downside which is adding a column that requires something to be in it. For example, let’s say you add a password field to a table. What to do then? Of course, this will depend on the code in question, but you can write code that will allow you to fill the field if it exists and ignore it if it doesn’t exist. One important part of this is that if you are adding data based on other points, you will need to add it as you populate the table, and also update the triggers to reflect the change. The benefits of changing a column type can have substantial performance payoffs. For instance, removing things like blobs or varchars out of a MySQL database can reduce the memory footprint of a table. In general column type changes shouldn’t have any fidelity changes. And as a result, they should be as simple as adding a column as above. For example, changing a signed int to an unsigned tinyint doesn’t change anything. Same with a varchar to an enum. When it comes to populating the table you might need to cast things accordingly. Or perhaps you will find one bit of data doesn’t quite sync up with what you thought was there. Renaming a column type is where things get a bit more tricky. Renaming a column for instance from pdf_identifier to pdf_id can have long ranging consequences with code. If you change the database and the field disappears the code will not know what to do. That is why it’s important to ship code that will allow both to happen before migrating the table. That is three times more complicated than most deploys! So if you can, it’s best to try to avoid these types of triple deploys. If a table is small enough (<50k rows) then it’s probably just safe to migrate it using an ALTER command. Removing a column is by far the most complicated to do without any downtime or errors in judgment. Whenever you remove a column you need to realize that the data doesn’t go to a trash bin, it’s gone forever. So when it involves customer data, it’s important to be careful! Zero-downtime migrations can be tricky to pull off using SQL so whenever possible try to rely on a script like pt-online-schema-change which will automate some of this for you. Although even though that tool works well, it can sometimes not work as well as expected which is why this article exists. These migrations take a long time to execute, and are tedious but can prevent you from losing money and possibly your customers. If your app isn’t online, then you can easily be losing thousands of dollars a minute as your users either go elsewhere or can’t make money themselves...which easily justifies the cost of having someone methodically go through zero-downtime migrations.